T-shirts in sizes S, M, L, XL in either navy blue or light grey, featuring a map of the Myra Canyon are available for $15.00 plus $6.00 for shipping and handling. This book celebrates the unsung heroes who built the stretch of the KVR from Myra Canyon to Penticton – through mountains, up impossible grades and along trestles across deep canyons. These men, also called navvies or blanketstiffs, toiled with pick and shovel, sledge and scoop. They engaged in the tough work of levelling grades, blasting and filling holes, digging foundations and pounding spikes. Here, Williams tells their story. He tells us where they came from and provides new details on life in the construction camps as well as highlights of their workday. He writes of those who cared about the navvies, revealing the life of those who truly built the Kettle Valley Railway. Maurice Williams is Professor Emeritus (UBC). Hard cover – collector’s copies of Myra’s Men are available only from the Myra Canyon Trestle Restoration Society. Each copy is numbered (only 200 printed) and is signed by the author. Sale Price: $35.00 plus $10 shipping and handling. Soft cover – also available in bookstores. Price: $20.00 plus $10 shipping and handling. 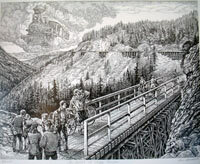 A print of “The Spirit of Myra Canyon” or the framed original is available from Picture Perfect in Kelowna or Vernon. The limited edition prints sell for $100 each, or a framed limited edition print is available at the special price of $325. 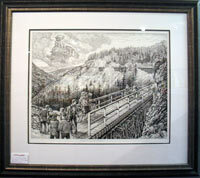 The framed original is priced at $1200. Copyright © 2019 Myra Canyon Trestle Restoration Society. All Rights Reserved.